Our tastes are eclectic and so is our fabric....lots of Bali Batiks, oriental fabrics, black and whites. We carry modern fabrics like Kaffe, but we also have a lot of civil war reproduction fabric. We have something for everyone. Newest addition to the store is our nursery. Located upstairs, the nursery has almost 400 bolts of children's fabrics. Also, in the nursery are the books and patterns that you would need to get those creative juices flowing. The toys are on loan from our kids. 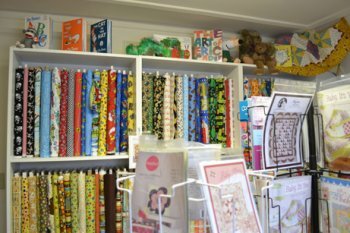 Our holiday room is full of Christmas and Halloween fabric, books and patterns. We leave the holiday fabric out all year because you never know when the muse will strike! Do you love handwork? Our penny wool and crazy quilting area has what you need. We have expanded our wool fabrics, the pearl cotton threads, silk ribbons and penny wool and embroidery books and patterns. We have a library card catalogue cabinet full of fat quarters. And we will cut you a fat quarter if you do not see what you want in our fat quarter drawers. In fact, we will cut your fabric any length you want… we start at 1 inch. Want 5 inches of fabric? We will cut you 5 inches. No minimum length. You get what you want. 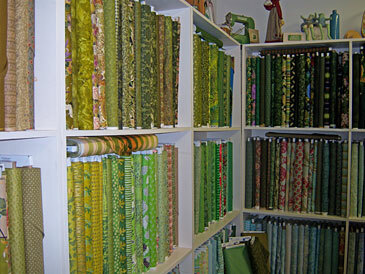 We love color and you will see that represented in the diverse fabrics that we carry in the store.